Lifelong Colorado residents, Brad and Georgi Pelsue live in Denver in sight of the scenic, soaring Rocky Mountains. They love the local landscape, but they also appreciate the culture of the capital city. Brad plays jazz saxophone, woodwinds and piano, and Georgi gardens and paints acrylic creations on canvas. The sound of his music and the colors of her abstract works fill their home. The Pelsues raised their children to value Christian education as well as the arts, sending them to a Christian high school and approving their decision to attend Westmont. "Sarah and Joel benefitted greatly from their education and Christian experience at Westmont," Georgi says. "We believe very strongly in Christian education." "Our goal was for the kids to have a solid education as well as a valid Christian one," Brad says. "Westmont really works on that, and we appreciate it." The couple made a provision for the college in their estate plan and are members of the Wallace Emerson Society. "Westmont gave our children a great foundation," Brad says. "The college is a deserving beneficiary." Sarah Pelsue Richards '90 earned a degree in sociology and psychology and lives in Florida with her husband, Tom, and their three daughters. They own Richards Appraisals, and Sarah has her own real estate company. Joel '92 and Michelle Klukow '92 Pelsue started Arts and Entertainment Ministries to support artists through small groups, prayer, mentoring and education. They live in Los Angeles with their children. Joel majored in philosophy, while Michelle studied theatre. Brad runs a family business he took over from his father that makes specialized tools used in telecommunications, utilities and homeland security applications. 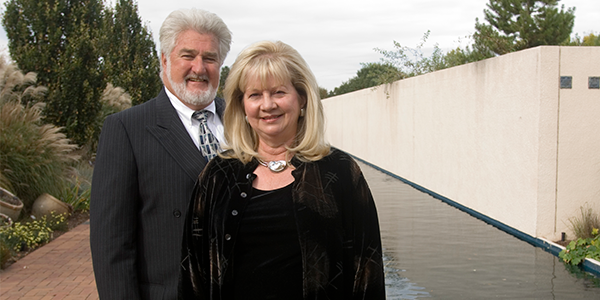 In addition to building the firm, he helped develop Faith Bible Chapel in Denver and served on the worship team. They attend the Greenwood Community Church in Greenwood Village. The Pelsues are thankful for 50 years together and children who share their values. Reproduced with permission from the summer 2006 Westmont College Magazine. For more information about ways you can include the college in your estate plan, please contact the Office of Gift Planning at (805) 565-6058 or giftplanning@westmont.edu.